Naomi is now playing match-maker with Boaz. She tells Ruth to go to the winnowing party and look her best. Then, once Boaz is finished eating, Ruth is to uncover his feet and lie down. 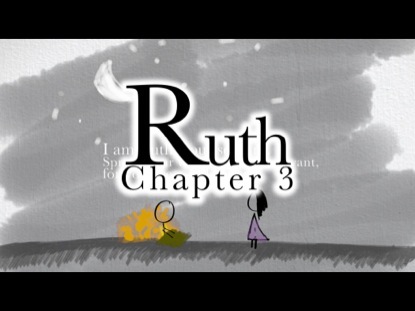 Ruth complied, and Boaz wakes up, realizing Ruth is lying at his feet. Ruth’s reputation as a noble woman has spread, and Boaz agrees to marry her if the other, closer kinsman-redeemer refuses. Ruth leaves early, not wanting it to be known that she came to Boaz. Boaz gives her grain to take back to Naomi and heads off to see if he can marry Ruth or not. 9) Naomi feels like it’s her obligation to try and find Ruth a husband to care for her because she knows she will die at some point. She picks this plan because she knows Boaz is a kinsman-redeemer, she knows Boaz knows who Ruth is. Naomi probably knows Boaz likes Ruth as well. The pros is what happened: Boaz realizes Ruth wants to marry him, and he goes off to see what can be done about it. The cons are what didn’t happen: Boaz refuses Ruth or someone finds out a woman came to the threshing floor or Boaz mistreats her in some way. 10) Spreading of the wings is a sign of protection and refuge in ancient Israel. Ruth is asking for Boaz’s protection by marrying her. It’s similar to God’s protection. 11) Boaz always treated Ruth with respect and admiration as does Jesus. Boaz was Ruth’s kinsman-redeemer as Jesus is ours. Ruth and Boaz dipped their bread together in wine vinegar. The meal should remind us of our communion with Christ where the bread is symbolic of Christ’s flesh and the wine symbolic of His blood which is poured out for us (see Luke 22). It is also significant that the narrative unfolds in the town of Bethlehem, the city where Christ was to be born many hundreds of years later. Bethlehem means “house of bread.” Jesus declares Himself to be “the bread of life” (John 6:48). Boaz loves Ruth; Christ loves us. Ruth as a Moabite is undeserving of Boaz; we are undeserving of Christ. I love how it’s Naomi who prompts Ruth. She cares for Ruth and wants to take care of her. I love Boaz. He does everything right. He wants everything to be legal. He loves Ruth. Great example of how one must keep striving to overcome adversity with faith and God will reward us. It is now the end of the harvest and Ruth and Boaz have spent time together in the context of a group – the men and women who worked for Boaz in the harvest. There is no “dating” as we know it. They got to know each other pretty well – by seeing what kind of people the other was around a larger group. The kinsman-redeemer was responsible to buy a fellow Israelite out of slavery (Leviticus 25:48). The kinsman-redeemer was responsible to be the “avenger of blood” to make sure the murderer of a family member answered to the crime (Numbers 35:19). The kinsman-redeemer was responsible to buy back family land that had been forfeited (Leviticus 25:25). The kinsman-redeemer was responsible to carry on the family name by marrying a childless widow (Deuteronomy 25:5-10). Since Boaz was a recognized goel for the family of Elimelech – the deceased husband of Naomi and father-in-law of Ruth – Ruth could appeal to him to safeguard the posterity of Elimelech’s family and take her in marriage. It may seem forward to us, but it was regarded as proper in that day. If Boaz did not fulfill this duty towards Elimelech (though he was now deceased), then the direct family and name of Elimelech would perish. Perpetuating the family name of Elimelech (and every man in Israel) was thought to be an important duty. These protections showed how important it was to God to preserve the institution of the family in Israel – and that it is also important to Him today. What does Ruth lying at Boaz’s feet show? Ruth’s actions were one of submitting. In that day, this was understood to be the role of a servant laying at a person’s feet was the role of a servant. It showed he or she was ready for any command of the master. So, when Naomi told Ruth to lie down at Boaz’s feet, she told her to come to him in a totally humble, submissive way. Of course, this was a situation that had the potential for disaster if Boaz should mistreat Ruth in some way. But Naomi and Ruth had the chance to get to know Boaz, and they knew what kind of man he was – a good man, a godly man, one to whom Ruth could confidently submit. What do we learn about marriage? In the marriage relationship, many wives wish they had a husband who loved, cared, and treated them the way Boaz did towards Ruth. But do they show the same kind of humble submission and respect Ruth showed to Boaz? Why was Boaz sleeping on the threshing floor? Boaz slept at the threshing floor to guard his crop against the kind of attacks described in 1 Samuel 23:1. In the days of the Judges where a lot of Israelites had turned their back on God, many turned to thievery and stole grain from farmers. Much political and social unrest was occurring as well. He was startled waking up to Ruth, thinking it may be a robber. Again, she submitted, identifying herself as his servant. In Ezekiel 16:8, God uses the same terminology in relation to Israel: I spread my wing over you and covered your nakedness. Yes, I swore an oath to you and entered into a covenant with you and you became Mine, says the LORD God. This was not an inappropriate thing for Ruth to do towards Boaz. It was bold, but not inappropriate. Ruth understood this as she identified Boaz as her close relative (literally, you are a goel, a kinsman-redeemer). Though deceased, Elimelech had the right to have his family name carried on and as goel, Boaz had the responsibility to do this for Elimelech. This could only happen through Boaz marrying Ruth and providing children to carry on the name of Elimelech. Ruth boldly, yet humbly and properly, sought her rights. Apparently, there was a considerable age difference between Ruth and Boaz. It also seems that because of this, Boaz considered himself unattractive to Ruth and had therefore ruled out any idea of a romance between them. Boaz had the right to force himself upon Ruth as her goel, but he did not. Literally, Boaz called Ruth a hah-yil woman. The basic meaning behind this Hebrew word is “strength; moral strength, good quality, integrity, virtue.” This same word is used for heroes in the Bible: A mighty man of valor. 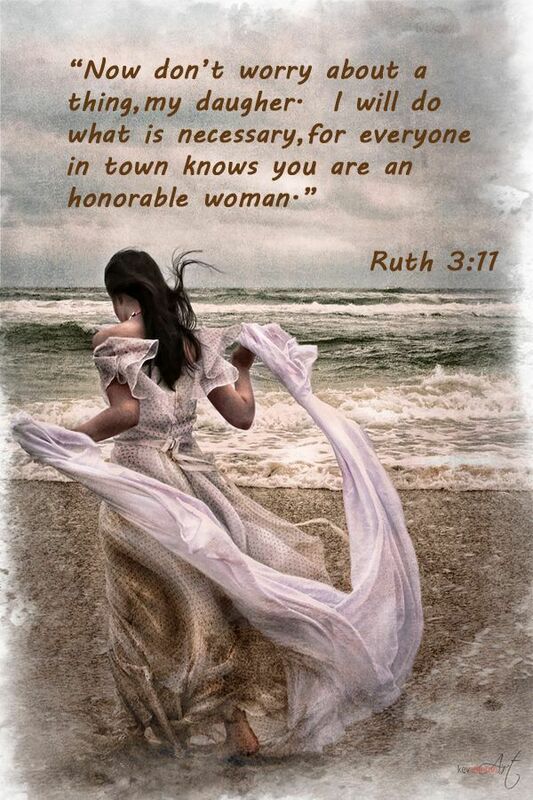 Ruth showed courage and strength, shown in her virtue – make her a hero, on the Proverbs 31 kind of definition of a woman of virtue. Boaz and Ruth were not trying to hide anything scandalous; it was just that Boaz didn’t want this nearer kinsman to learn that Ruth was now demanding her right to marriage to a goel before Boaz could tell him personally. Fun Bible Fact: Jewish traditions say that the six measures of barley given as a gift to Ruth were a sign of six pious men who would descend from her, endowed with six spiritual gifts: David, Daniel, Hananiah, Mishael, Azariah, and the Messiah.